This list of furniture companies includes firms that specialize in upholstered living room furniture such as couches and love seats as well as sectional sofas and sleeper sofas. Some of these firms also design and manufacture coordinating furnishings and accessories for the home. American Leather produces leather upholstered furniture, including sofas and love seats, sectionals, chairs, and sleepers in traditional, transitional, and contemporary styles. Ashley Furniture, based in Wisconsin, is a residential furniture brand. In addition to living room couches and love seats, the company also features reclining sofas and sectionals. Bassett Furniture operates a series of furniture stores that strive to offer well-made, affordable home furnishings, including leather and fabric upholstered sofas. Bernhardt, located in the foothills of western North Carolina, is a manufacturer of case goods and upholstered furniture. Broyhill Furniture's extensive product line includes numerous couches and sofas both in upholstery and leather ranging in style from Traditional, European, and Country Cottage to American Casual, Contemporary, and Eclectic. Burton James, located in Southern California, designs and manufactures handcrafted upholstered furnishings for the home. Craftmaster Furniture, located in Taylorsville, North Carolina, specializes in customized upholstery furniture. Many styles, designer fabrics, and wood finishes are available for their seating products. Flat Rock Furniture, with corporate offices in Shelbyville, Indiana, manufactures solid hickory, hand-crafted furniture. Hiatt Furniture, an upholstered furniture manufacturer based in California, strives to provide its customers with technologically advanced furniture at consumer friendly prices. Hickory Chair, founded in 1911 to produce made-to-order dining room chairs, has expanded its line to include tailored upholstery furniture as well as classic wood furniture. Jackson Furniture, a family-owned living room furniture manufacturer based in Tennessee, offers mid-priced and value based living room sofas. Kincaid Furniture, a solid wood furniture maker, offers a wide range of sofas in its various furniture lines. Design your furniture layout with their online room planner. Kosta Furniture is a Florida-based furniture company that caters to hospitality industry requirements. The firm works with interior designers to produce designer furnishings for hotels and time share properties. LaCrosse Furniture, located in LaCrosse, Kansas, manufactures affordably-priced sofa-sleepers and sofas as well as love seats, chairs and ottomans. Omnia Leather, designer and producer of both stationary and reclining sofas, specializes in leather upholstered seating products such as sofas, chairs and sectionals. Pearson Furniture has been producing fine, custom ordered upholstery furniture for over fifty years. 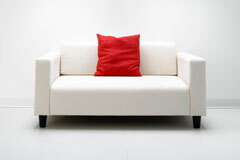 Their Personal Choice collection offers custom designed, bench-made sofas, love seats, and sectionals. Taylor King Furniture, a locally-owned furniture manufacturer based in Taylorsville, North Carolina, offers comfortable, bench-made upholstered seating and coordinating accessories for the home. Tomlinson, based in North Carolina, offers contemporary and traditional sofas, sectionals, and chairs as well as sofa-sleepers and ottomans.